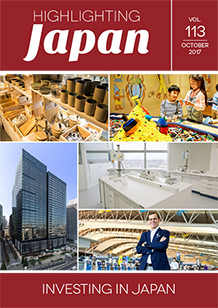 Foreign businesses no longer view Japan as a land of high cost with low return on investment,” says Shigeki Maeda, Executive Vice President of Japan External Trade Organization (JETRO). In this month’s Feature, we investigate the changing nature of foreign direct investment in Japan. Shigeki Maeda, Executive Vice President of Japan External Trade Organization (JETRO), reviews initiatives to promote Japan’s investment environment. French dermatological cosmetics manufacturer Pierre Fabre began formulations activities in Tokyo last year. Danish sundries company Sostrene Grene is winning fans in Japan. LEGOLAND® opens in Nagoya, Aichi Prefecture. Domestic and foreign startups get a helping hand at the heart of business and finance in Japan.